Paella is a classic rice based dish from the Valencian region of Spain. 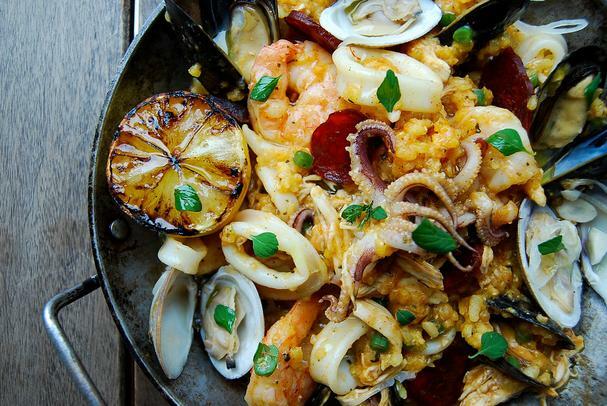 This seafood version, known as paella de marisco, is loaded with shrimp, calamari, baby octopus and mussels and is seasoned with a beautifully aromatic and flavorful saffron-kissed sofrito broth. This version of Valencia’s signature dish comes from Chef Michael Kramer at The Lazy Goat in Greenville, South Carolina. The long list of ingredients makes it look far more complicated than it actually is, but don’t be deterred! It’s quite easy and it will make a week’s worth of delicious leftovers. TIP: Line up all of your ingredients “mise en place” to simplify cooking. Also, unless risotto which requires a lot of stirring, make sure you don't stir the paella too often and this will result in gooey rice! 1. Heat a large sauté pan until smoking hot. Very carefully add 3 tbsp. of olive oil. 2. Add the red onion and crushed garlic, stirring constantly until slightly charred for two minutes. 3. To the onion and garlic, add the bell peppers and Serrano chile and continue to cook at high heat for 3 minutes. 4. Add the chopped roma tomatoes and allow to cook for 7 minutes or until all of the liquid has evaporated. Season generously with salt and pepper. 5. Once the tomatoes have cooked down, add the white wine and sherry and reduce by half. 6. Add the heavy cream and saffron bringing to a boil. Once boiling, turn off the heat and add the torn cilantro. 7. Allow the mixture to cool. Once cool, transfer to a blender and blend. 8. In a large pot heat the stock to boiling and reduce to a simmer. Slowly add the sofrito to the stock whisking constantly. Allow to simmer while you prepare the rest of the paella. 1. Heat a large sauté pan over medium heat. 2. Add 3 tbsp. olive oil to the pan and sauté the shallots. 3. Once the shallots are translucent, add the rice and chorizo to the pan stirring constantly as in the preparation of risotto. 4. Gradually add the stock, ladle by ladle, stirring constantly until all of the liquid is absorbed and the rice is tender. 5. Turn off the heat and add the roasted peppers, cherry tomatoes, asparagus, and snow peas. Season with salt and pepper. 6. Season the shrimp, calamari and baby octopus with salt and pepper and sauté in a separate pan. Remove and set aside. In the same pan, add 1 cup water or dry white wine and bring to a boil. Add the mussels; cover and steam until they open, about 2-3 minutes. 7. Transfer the paella to a large serving dish (or serve in the paella pan) and top with the grilled shrimp, calamari, baby octopus, and mussels. 8. Serve with fresh or grilled lemon wedges on the side.